Thinappuyal English News. – BIO-CONTROL MEASURES TO CURB ‘SENA’ MENACE. BIO-CONTROL MEASURES TO CURB ‘SENA’ MENACE. Thinappuyal English January 16, 2019 Comments Off on BIO-CONTROL MEASURES TO CURB ‘SENA’ MENACE. 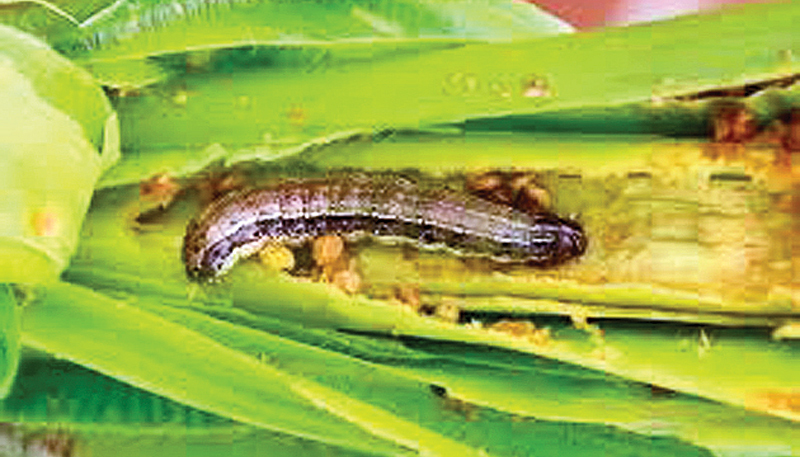 The Agriculture Department has taken action to develop a tolerant variety and introduce bio control measures to curb the Fall Army Worm (FAW) or Sena menace. Agriculture Director General W.M.W. Weerakoon told the Daily News yesterday that there are viruses infected in this pest in other countries and they hope to use all the integrated pest management technologies to thwart this fast spreading caterpillar locally known as the Sena caterpillar. The Department initiated weekly campaigns in November and December last year and again from January 16 to 31 in an islandwide campaign with officers from Agriculture Department, Agrarian Services Department and the Mahaweli Development Authority participating. We are also obtaining the FAO and other international organizations’ support and also from universities to curb this menace,” he added. The ‘Sena’ catepillar initially detected in Ampara and Anuradhapura districts has now spread to several other districts. The caterpillar variant has caused damage to corn fields and reports said that it is now affecting other types of crops. The Agriculture Department has instructed paddy farmers to be vigilant on the presence of the worm in their fields and to take immediate measures to mitigate the risk of spreading. Around 50 percent of about 80,000 hectares of maize cultivated lands has already been affected and the economical damage is less than 20 percent. “Even though we can find the caterpillar in the maize pod very rarely we see that the caterpillar has damaged the pod,” he said. The DG further said that the maize crop is now getting matured and the pest may go to the paddy fields. This pest can eat about 80 crops. FAW is regarded as a highly invasive species due to its ability to spread and reproduce quickly. Female can lay over 1000 eggs during her lifespan. The larvae stage is responsible for damaging the crop, and the adult moths move in the direction of the wind, which can reach up to 100 km a day. “We can’t stop them spreading. But we are trying to at least to delay the spreading.We ask all who transport maize to chop the pods before transporting them to kill the larvae,” he added. “Three and half months ago we had information that the Fall Army Worm had damaged maize crops in Anuradhapura and Ampara. From then onward we educated farmers and introduced all mechanical and chemical measures that can be taken to control this menace. But during that time we didn’t have a specific chemical since this was a very new pest we started to identify the chemicals, he said. Five chemicals have been recommended now.But as far as experience in other countries is concerned, this pest cannot be controlled with chemicals alone.We decided to induce other controlling measures like spreading ash, mechanical removal and use of pheromone traps to attract mail moth.